Plant City Dolphins JV coach Marcus Springfield has won three TCYFCC Superbowls in four appearances. If anyone knows how to deal with high expectations, it’s Marcus Springfield. That comes from the resume the Plant City Dolphins’ new Junior Varsity head coach has built up in his four years and change with the Tri-County Youth Football and Cheerleading Conference program. Springfield has won three league championships (“Superbowls”) in his four years with the team. He became head coach after his first season and notably led the Midgets team to back-to-back championships in the past two seasons — including an undefeated season last year. Springfield said the move up to JV has made things more difficult, as the game really opens up after the Midgets level. His spread offense is now more pass-heavy than what he ran with previous teams and the players are learning more about route trees. The base 4-4 defensive scheme came with him. The coach himself said the kids teach him new things every day. Despite the adjustment, things are already looking good for this season. The JV Dolphins have a 3-0 overall record and are fresh off a 40-0 win over the Mulberry Seahawks from Aug. 25. The first two games had the Dolphins beating the Pinecrest Pilots, 30-12, then picking up a 12-6 win over the Lakeland Hurricanes. The Dolphins, as with all other TCYFCC teams, are in a bye week for Labor Day and will try to keep the win streak alive next Saturday against the Southwest Junior Saints. The key to getting his players not only to buy in but also to trust themselves and each other enough to meet the Dolphins’ goals is empathy, Springfield said. Springfield himself is on a 19-game, two-Superbowl winning streak between the Midgets and JV teams, but he’ll be the first to acknowledge none of that is possible without support from the players, coaches and parents. Everyone on board knows the high expectations come from his high standards and goals set before the season. Though Springfield likes to take things on a week-to-week basis, he’ll admit he does have the future in mind. 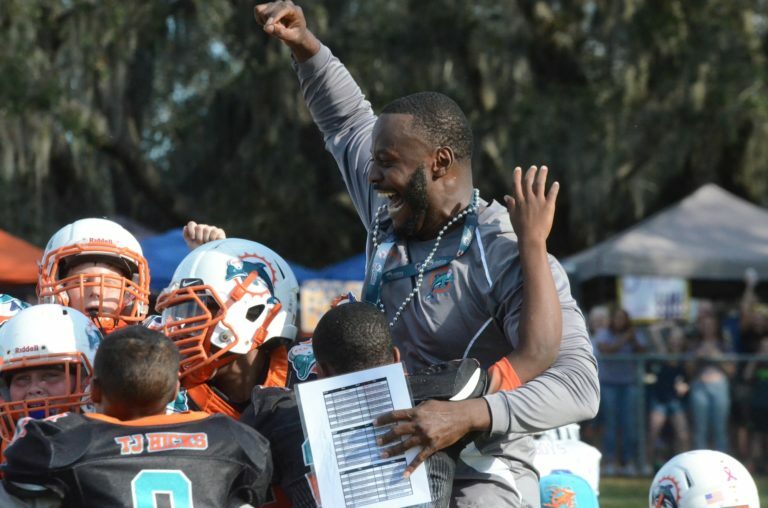 The annual UYFL national championships are held in Plant City every December, and several Dolphins teams often make appearances along with other TCYFCC teams (or, in some cases, all-star teams assembled specifically for the tournament). An interesting wrinkle with the TCYFCC’s 2018 season is that all of the age groups now have unlimited weight requirements, which mirrors UYFL rules. Potentially, that means Springfield’s JV team will be able to enter the tournament as-is whereas, in the past, his Midgets and other coaches’ Dolphins teams had to be mixed up for tournament play due to conflicts between the TCYFCC and UYFL age and weight requirements.